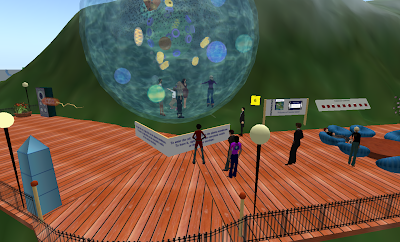 On January 30th, I attended my first virtual conference called Stepping into Science through Second Life. For those of you that are not familiar with second life, it's a completely virtual way of communicating and networking. Prior to the conference, I had to create an avatar by going to http://www.secondlife.com/join , confirming email and downloading the second life software. There was also an orientation held to make sure you knew how to navigate and use the tools such as teleporting, flying, moving, searching and so forth. The conference had many of the familiar qualities a face-to-face conference. The conference schedule existed of a Keynote speaker named Troy McConaghy who works on media projects related to science and technology. There were breakout sessions that allowed you to pick from various field trips to Genome, Astronomy, NASA, and Earth Systems. We also participated in a live segment on NPR (National Public Radio) called Science Friday. The conference closed with a Q & A segment with the panel members. Second Life has participants from everywhere. They host many organizations that choose to do things in the virtual environment that involves virtual members. Second Life is organized into islands. Each island is a different place for members to meet. Islands can be restrictive or free. Many educational institutions do not restrict entrance to their island. Institutions such as Harvard, Stanford, NASA, NOAA all have islands. Membership to Second Life is supposed to be restricted by age. You have to be 18 to have membership, but I don't recall inputting my age. Although there are islands that are for younger students called Teen Grid. In addition to educational institutions, many museums are beginning to create these virtual environments as tours. One of the most powerful things I learned in this conference is the ability to create a virtual environment more authentic to the learner than a face-to-face classroom. I went on a field trip to Genome hosted by a lady from Northern Michigan University. The picture I chose to use for this blog shows some of the capability of virtual worlds. Here you have a model of a prokarytic cell. As members on this island, you can enter the cell. You can see all the cell organelles and be able to click on them as they float by you and learn about each organelle. This particular cell is designed as close to a real animal cell as possible so that you're experiencing the cell environment accurately depicted. The only way to exit this cell is by exocytosis, the real way things pass out of cells. After you are in Second Life, I can send you SLURLS to teleport you to some of the sites that are available to use. This is because the links only work within Second Life. A note card with links can be sent to you to direct for islands that I would recommend. I think I've written enough...I'll tell you more in the VSDL meeting. I spent some time installing the program (wouldn't work on my Windows machine) but I finally got in. I can see what Clinton said about the motion sickness factor. There's a very fine line for me when I start to navigate. So far I browsed some educational sites, tried to update my clothing and visited the Eiffel tower. There are probably many educational uses so it's just finding the right place to direct students. Mahalo Komarey for sharing your Second Life experiences! I went in and it took me a while to figure out how to navigate. I plunged into the ocean and went for an unintentional swim. Of course, I tried to change my outfits a few times, too. I can totally see how students would be motivated to interact in this virtual world. I can also imagine how much more engaging it could be to do online learning activities that normally would be difficult to accomplish like labs and even virtual field trips. Looking forward to visiting the educational sites as a group tomorrow.